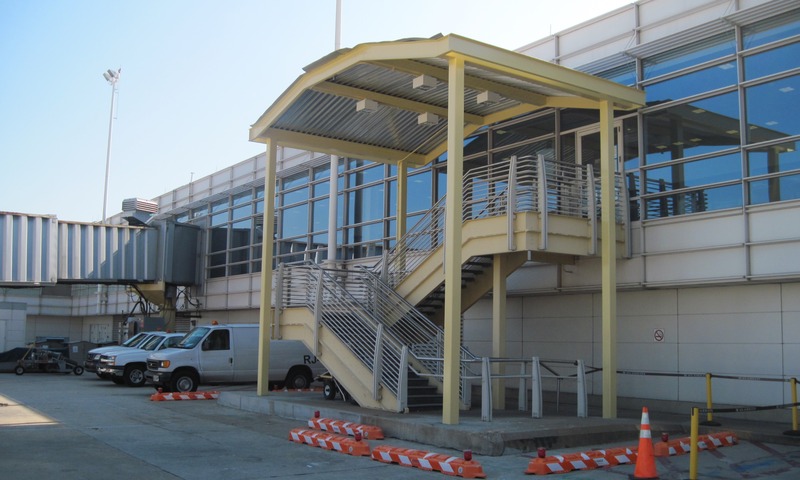 Canopies were designed for an airport tenant at DCA to cover exterior stairs and sidewalks, providing protection from the elements. The stairs are used to transfer connecting passengers, via bus, between the post-security locations of the north and center piers. The stair canopies incorporate arched steel tubes and steel roof deck. The sidewalk canopies are located at the north side of the north pier, with new columns hugging the terminal outline and beams cantilevering over the sidewalks. The cantilevered canopies provide overhead cover to the sidewalks where passengers embark and disembark buses that carry them to and from commuter aircraft hardstands. Existing underground utilities crossing the site and poor soil conditions required the strategic placement of helical pile foundations and pile caps. Constructability considerations included phasing requirements for nearby gate operations.